In a bowl, add the flour, butter, egg, sugar, bicarbonate of soda and chocolate chips together. Mix until you have a smooth dough. 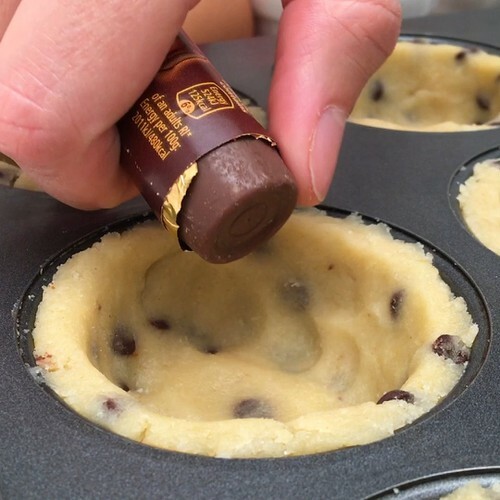 Add a scoop of cookie dough into each compartment of a greased muffin tin, and use your fingers to push the dough into a cup shape inside the tin. Add 3 Rolo's® to the middle of each one, then add a circle of cookie dough on top and seal the cup together. Bake the cookies in the oven for 20 minutes at 170°C. Remove them from the tin, add a ball of vanilla ice-cream on top of each, and drizzle with caramel sauce. Top with more Rolo's® and chocolate sprinkles. Serve warm straight away!